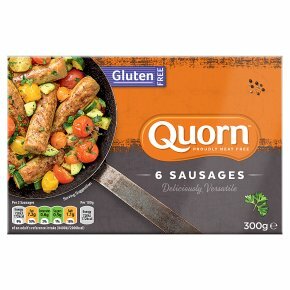 Meat free savoury flavour sausages, made with Mycoprotein? Proudly meat free. Deliciously versatile. Gluten free. Vegetarian Society approved. Cook from frozen.Remove all packaging.For best results Hob cook.All appliances vary, these are guidelines only.Check product is piping hot before serving. 14 MinPreheat 1 tbsp of oil. Fry over a medium heat, turning frequently. 18 MinPreheat oven to 200ºC/Fan 180ºC/Gas 6.Brush with a little oil. Place on a baking tray. Cook on the middle shelf.